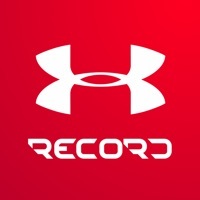 UA Record™ is the world’s first 24/7 connected health and fitness system. Track sleep, fitness, activity and nutrition. Set and reach goals, connect and sync devices, and follow friends and UA athletes. Get personalized insights to help you feel, look, and perform better. 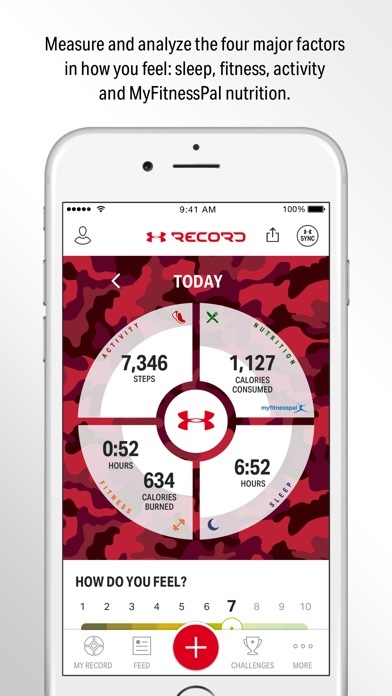 Use the complete and powerful UA Record™ app on its own, or with UA HealthBox™ and MyFitnessPal®. Track and Analyze Sleep, Fitness, Step Activity, Nutrition and Weight ⊕ Log workouts including gym, running, fitness classes, yoga, outdoor workouts, and more. ⊕ Use your phone's GPS to map your routes and see how far and how fast you run or ride. Connect your UA Band™, UA Heart Rate™, or other Bluetooth Smart heart rate straps to track heart rate for any kind of workout, including gym, treadmill and yoga. ⊕ See sleep, fitness (workouts), step activity, nutrition and weight activity all in one place. Use your iPod Touch, iPhone 5s, iPhone 6, iPhone 6 Plus or later to track your steps or connect an activity tracker (like UA Band™) or GPS watch. ⊕ Cross-compare data such as fitness vs. sleep, step activity vs. nutrition, and other combinations. ⊕ Get insights (powered by IBM Watson) to help you improve and see where you stand compared to similar users. ⊕ See your data visualized to identify trends and improve your performance. 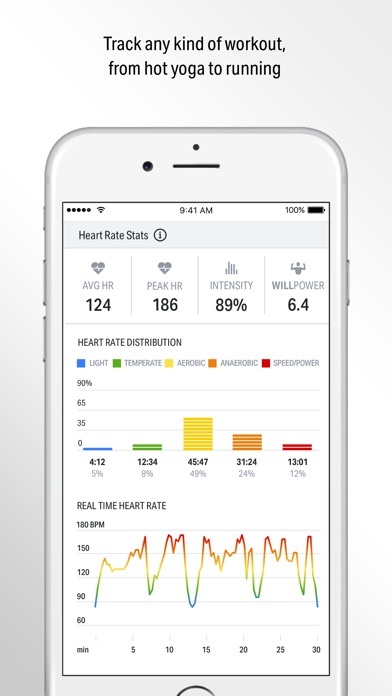 ⊕ Works with Apple Health. Set and Reach Goals ⊕ Set goals for sleep, fitness, activity, nutrition, and weight. ⊕ See progress to goals by the day, week, month, or year. 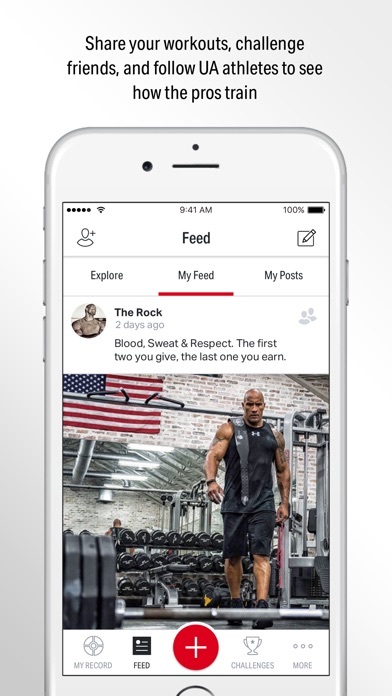 Join and Challenge the Community ⊕ Get inspired by the Under Armour fitness community and invite friends to join. ⊕ Like and comment on friends’ workouts, photos, and videos. ⊕ Create Challenges and invite friends to see who can log the most workouts, take the most steps, burn the most calories, and other activities. ⊕ Follow Under Armour’s elite athletes and see how the pros get it done behind the scenes and on the field. 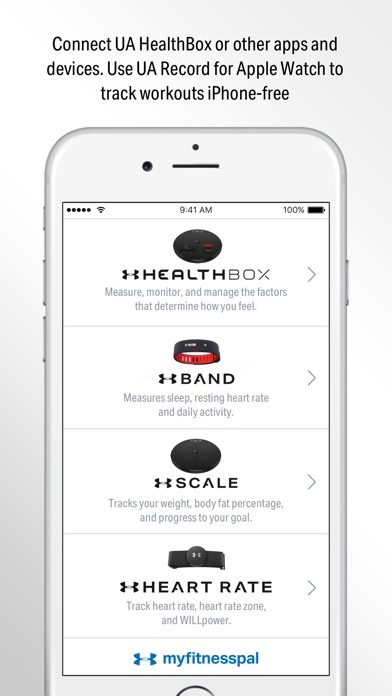 Connect and Sync Devices ⊕ Easily connect UA HealthBox™, UA Band™, UA Scale™, UA Heart Rate™ and other devices. ⊕ Connect apps such as MapMyFitness® and MyFitnessPal® to aggregate data and have a single view of your activity and progress. 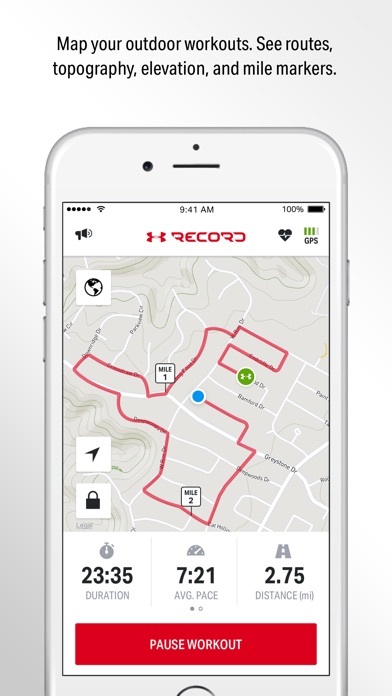 ⊕ Connect to share your UA Record™ activity with Apple’s Health app. Note: This app may use your location even when it isn’t open, which can decrease device battery life. IBM Watson is a trademark of International Business Machines Corporation, registered in many jurisdictions worldwide.